Last October’s opening of Pacific Standard Time, the Getty Center-organized mega-show of Los Angeles art from 1945-1980, was greeted with much fanfare in the national and international press, though from different perspectives. While California publications viewed the linked exhibitions at 130 museums and galleries as a long-delayed retrospective of the area’s painting, sculpture, design and photography, those outside California seemed to regard PST as revelatory, as if Southern California and its enormously varied trove of artwork had just been discovered. No one is suggesting that Los Angeles is about to supplant New York as an art capital; it is not lost on people here that the executive directors of three of the four biggest museums in Los Angeles are from New York. Here Nagourney has it backwards: Michael Govan and Jeffrey Deitch are here because Los Angeles represents the art world’s present and future, not because they’ve taken up missionary work. Nor for that matter has Larry Gagosian, whose first gallery opened here in 1979 and whose Beverly Hills gallery opened in 1995. Ironically, Nagourney’s comment that New York still contains the greatest concentration of galleries, museums and buyers is exactly the same argument that Parisians made after World War II, when all signs pointed to New York. The pertinent question is whether the art world centers on those who make art or those who consume it. If it’s the latter, New York still reigns. But if it’s the former–as it was in New York from approximately 1945-2000–the center of the art world moved west some time ago. The reasons for this aren’t hard to fathom. New York has become increasingly inhospitable to young artists due to its exorbitant cost of living, which puts studio space out of reach for all but the wealthiest and most established artists. In the last thirty years, young artists have gone from Soho to Chelsea to Brooklyn to Queens in search of studio space, gentrifying each before being forced out by rising rents. The last stop seems to be the South Bronx, where studios reportedly are still within reach. When that area becomes gentrified, artists will be shut out of New York City entirely, leaving it to the one per centers. Unfortunately for them, a city can’t be an art capital without artists, however many hedge fund managers decide to take up collecting. In fact, New York stopped being an essential destination for young artists years ago. Bypassing the city altogether, they found other, more welcoming places to live and work: Cincinnati, Philadelphia, Seattle, Portland and–most of all–Los Angeles. Those who came to study at Art Center, UCLA and Cal Arts simply stayed; others made Los Angeles their destination of choice. While rents here are hardly cheap, it’s still possible for young artists to find studio space, as well as a community of like-minded artists, a lively gallery scene, and more museums than they can reasonably visit in a year. Beyond the art world, Los Angeles has a creative atmosphere unmatched by that of New York or anywhere else. That the film and music industries are centered here provides still greater ferment, allowing writers, animators, painters, sculptors, musicians and other creative artists to inspire each other’s work. I’ve long felt that Los Angeles is the most creative city in the United States, if not the planet, and PST has gone a long way toward promoting that idea. But it was a recent radio interview with Werner Herzog that made me realize others feel the same way. Much to my surprise, I discovered Herzog has been living in Los Angeles for the better part of two decades, making a film a year and running the semi-secret Rogue Film School. When he stated that Los Angeles was most culturally important place in the world, the interviewer asked what about New York? Herzog replied that New York was “more on the receiving end of culture,” whereas the actual creative work was happening here. In light of this, Adam Nagourney’s assertions that “the sheer sprawl of the city” and “the difficulty of encouraging people to walk inside for anything but a movie in a city that has glorious weather so many months of the year” work against Los Angeles as an art capital seem nothing more than desperate cliches. And the latter comment, made despite ample evidence of crowds at LACMA, the Getty and MOCA, is a New Yorker’s fantasy of life in LA, not the art-filled reality. 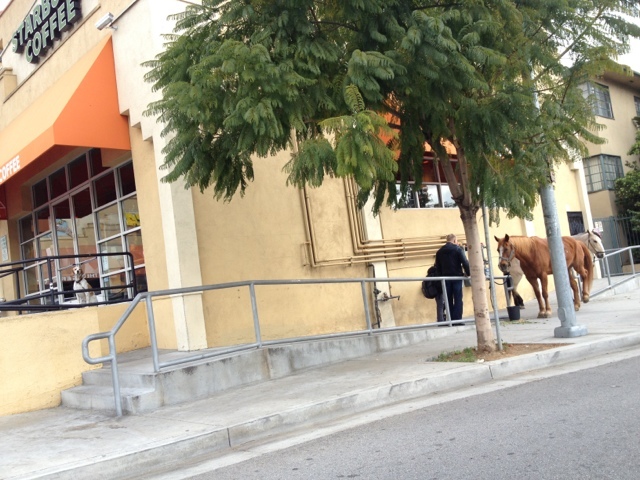 A stone’s throw from the scene of last night’s Academy Awards ceremony, two horses waited for their owners outside a Starbucks. Happy End-of-the-Awards-Season! You never know what you’ll find at the park under the Hollywood Sign. 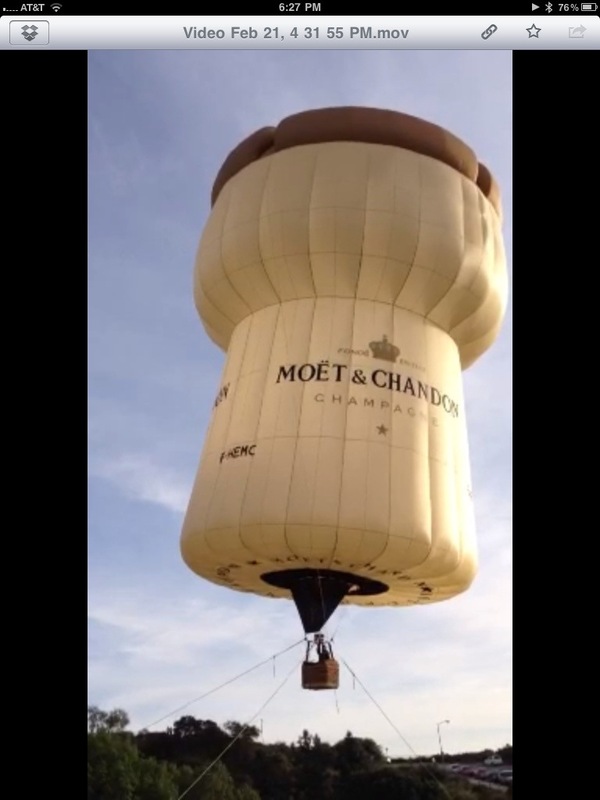 Today it was a giant hot air balloon for a Champagne commercial. The brand and shape were revealed as the balloon inflated. When I moved to California from Boston 30 years ago, I felt I had immigrated to another country. It wasn’t just a matter of climate: people dressed differently, listened to different music, ate different foods–in essence, they were culturally distinct. The experience was both disorienting and exhilarating, and so compelling that although I stayed in-state for the next two years, I felt I had traveled widely. At the same time, I remember vividly the anti-California sentiment of East Coast newspapers and magazines. In the days before the New York Times regarded itself as the nation’s newspaper, mocking references appeared constantly in its pages, as well as those of the Wall Street Journal. I lived eight years in Berkeley, a lovely university town portrayed by the East Coast press as an absurd hotbed of indolence, radical politics and gourmet food. A particular low point was a Wall Street Journal article whose author claimed to have seen a cake inscribed “Victory to the Sandanistas.” Although no one from Berkeley ever saw this cake, the article was widely reprinted. The derision was universal and lasted about two years. “Moment By Moment” is this year’s California “problem” picture, that is, a movie in which people suffer for reasons that never seem very urgent in settings that, though not particular to California, are emblematic of what we think of as the California culture–elaborate beach houses, imported automobiles (public transportation is nowhere in sight), on throughways that are the main arteries of late 20th-century rootlessness. GRANTED, the Los Angeles tourism board will never lure visitors with ”Got culture?” After all, even a local hero, the writer Raymond Chandler, once called this place ”a hard-boiled city with no more personality than a paper cup.” But on a recent Friday night at the Armand Hammer Museum of Art, even the most disdainful of Los Angeles critics would have eaten his hat. Nevertheless, the past few years have brought improvements in the New York Times’ attitude. Not only does it take Los Angeles far more seriously, with an excellent bureau and in-depth reporting, but it covers stories that formerly would have been of no interest to New Yorkers, such as Hollywoodland’s problems with tourist traffic. Though I used to find it weird, I’ve grown accustomed to reading minutiae about Los Angeles in the Times. At this point, it seems no Los Angeles story is too local, including one about a dispute among members of the Woman’s (sic) Club of Hollywood. Nevertheless, when I found myself reading about a labor action at my neighborhood car wash a couple of years ago, I wondered whether things hadn’t gone too far. Next: Two cities and their artists. Every so often it’s nice to get out from under the Hollywood Sign and go somewhere else–in this case, New York. Beyond the usual fun with friends, I wanted to see “Other Desert Cities” on Broadway with its current cast: Stockard Channing, Stacy Keach, Rachel Griffiths, Judith Light and Justin Kirk. The play concerns the Wyeths, a wealthy retired couple living in a Lautner-esque stone-and-glass mansion in Palm Springs. Like Ronald Reagan, who gave him an ambassadorship, Lyman Wyeth (Keach) began as an actor and used his Hollywood fame as a springboard into Republican politics. His wife Polly (Channing), an impeccable blonde given to hilariously brittle observations, used to be part of a screenwriting team with her sister Silda (Judith Light), but quit Hollywood when it stopped being “fun.” The Lymans have two grown children–a troubled writer daughter named Brooke (Griffiths) and a TV producer son named Trip (Kirk). We soon learn there’s another Wyeth son–Henry, the eldest, who got mixed up with a radical group that bombed an army recruiting center in the early 70s, committed suicide by drowning, and is rarely spoken of by his family. The play takes place during Christmas (naturally), when Brooke, home from the East Coast after a lengthy self-exile and nervous breakdown, unleashes her new manuscript on her unsuspecting parents. Called Love and Mercy, it deals with Henry, the long gone and strenuously unmentioned brother. Much drama ensues, along with a surprise I won’t reveal here. But what I can talk about without spoiling the plot is Brooke’s stubborn insistence that the book be published right away, with a lengthy excerpt in the New Yorker no less, and as a work of nonfiction. Her distressed parents beg her to withhold publication until after their deaths. But no one suggests the obvious: to publish the book as a novel. After all, that’s what it is–an imagined account of a boy the author knew only when she was a child, and whose last, troubled months were unknown to her. There’s no more objective truth in Brooke’s book than there is in the most imaginative work of fiction, even if she can’t see it. Yet this option is never broached. The reason, I suspect, is that Brooke–for all her insistence that she doesn’t care about money–is well aware that the commercial prospects are far better for memoirs than novels. As a memoir, Love and Mercy is a sure-fire success; as a novel–well, who cares? Literary fiction in general challenges readers more than memoirs which, however “true,” tend to be more straightforward in style. But I would bet money that any novel, if presented as a memoir, would be more likely to be published, and more lucrative for the author. (Hence James Frey’s A Million Little Pieces, a roman a clef published as a memoir.) In her strident argument for publication, Brooke Wyeth proves as canny at business as she is at writing. If only her parents recognized it. Note: “Other Desert Cities” will play in Los Angeles, with the same superb cast, in August. I highly recommend it. You are currently viewing the archives for February, 2012 at Under the Hollywood Sign.